Over the weekend, my household gardener and brewmaster (a.k.a. Eric) met up with a chicken-keeping pal to trade some homegrown produce. In exchange for a bag full of jalapeños and habaneros and a nice bunch of fresh herbs, we got six eggs and the Largest Zucchini Ever. This zucchini was seriously about two feet long and weighed at least ten pounds! Eric took half of it to a Memorial Day pool party and grilled it in thick slices; I wasn’t sure what I was going to do with the rest. I don’t really get tired of squash—especially zucchini—and I’m glad it’s zucchini season. You can roast them, grill them, use them as filler, make them into soups, put them in pasta—the possibilities are nearly endless, and they are healthy and filling. But I am kind of afraid to see what size zucchini we’ll be getting from this guy by August! Anyway, this soup is easy, not requiring a lot of prep work, and the result is shockingly rich and quite silky! 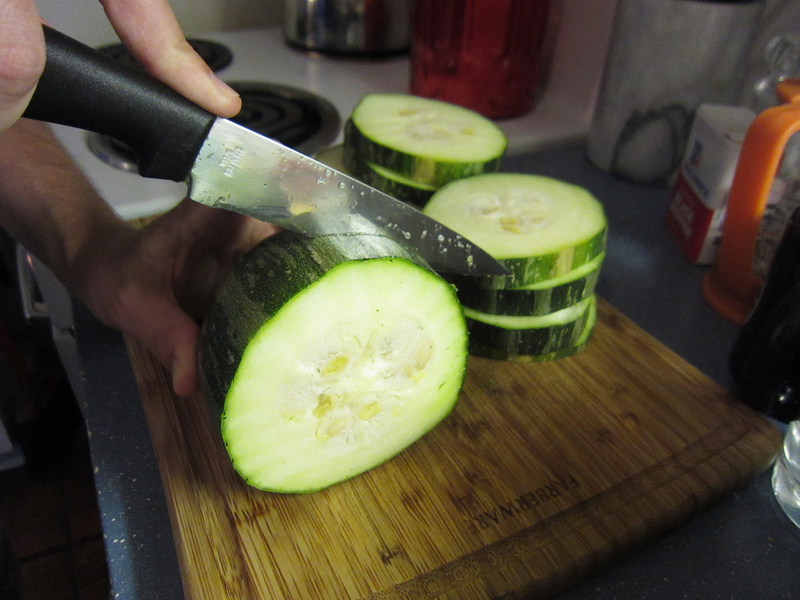 I would encourage you not to peel your zucchini; leaving the skin on adds to the nice green color, as well as providing additional nutrients. Sometimes leaving the skin on gives the final dish a bit of a bitter aftertaste, but, in this case, that’s more than compensated for by the half stick of butter. I also highly recommend making the sourdough croutons. The rich, tangy flavor of the bread, especially after it’s toasted in olive oil, is an excellent counterpoint to the fresh, creamy flavors of the soup. The addition of the croutons transformed this from a great dinner into a memorable one that I will no doubt make again soon. Especially if I get anymore ten-pound zucchini! 1. Preheat oven to 325°. In a large roasting tin, toss diced zucchini in about 1 tablespoon of olive oil, along with the garlic powder and some salt and pepper. Roast for about 30 minutes, turning the pieces over with a spoon about halfway through. 2. Meanwhile, heat remaining olive oil and butter over medium high heat in a large stock pot. Add onions and garlic, stir, and cook for about five to ten minutes, until onions are fragrant and translucent. Add celery, paprika, and a dash of salt and pepper, and cook for another five minutes. Pour in vegetable broth. As soon as it starts to lightly boil, reduce heat to simmer, cover, and allow to cook for approximately 20 minutes. 3. Remove zucchini from oven and add to pot. Stir thoroughly, and allow to cook for about five more minutes. Meanwhile, add the sourdough squares to the pan, toss in remaining oil and juices, and spread out evenly. Return the pan to the oven and cook for about three minutes, until nicely browned, then remove and set aside. 4. Remove soup from heat and allow to cool slightly (for about five minutes). Add greens, then pour the soup into a blender (you will need to do two separate batches) and blend to desired consistency. I prefer this soup very creamy, so I blend for about three minutes on a higher setting like “cream” or “purée.” After all your soup is blended, return it to the pot and stir in cream. Taste, and add more salt and pepper as desired. 5. Ladle out into serving bowls and garnish with the sourdough croutons. Serve immediately. Serves 4. Reheats nicely to make even tastier leftovers, and also freezes well. * I used homegrown green leaf lettuce. This entry was posted in Austin, Budget, Easy, Family, Gluten Free, Homegrown, Locavore, Low Carb, Mains, Recipes, Soup, Vegetarian by Susan. Bookmark the permalink. Oh man, I could definitely go for some of that! I love zucchini too. In fact, I had a simplified solid version of this soup with dinner last night–just two ordinary, not-terrifyingly-large zucchini sauteed with lots of garlic, salt, & pepper. SO GOOD. This sounds great! I’m going to make it when our Zucchini are in season. I’ve got 3 plants peeking through!